Worst money I ever spent. I know the picture is of a grizzly item but they are both the same thing. All of the parts are interchangeable. So what did I like best about this item…selling it for a loss. At least the guy who bought helped drag the piece of stuff out of the basement. I told him it was finicky about power and he would need a cooling fan for the motor. I think the longest it ran before the motor tripped on an overheat was about 15 minutes and I was hardly sanding the wood.This has to be the most disappointing item I have ever purchased. The only reason I am giving it 2 stars is because it did start and the drum was round. Tracking was relatively easy to accomplish. Loosen two lock nuts and turn the bolts to shift the platen and it came in pretty quick. Belt changes were not that difficult. It does need to be lubricated every hour it runs, not that I got an hour of run time out of it. If someone where to tell me they were going to be buying it I would try very hard to talk them out of it. P.S. THe sander I owned was a different color, does that mean I shouldn’t post this picture either?? Your overall point on the drum sander is well taken, but I think it is in poor form to place a picture of a competitor’s product in a review of a different manufacturer’s product. You do not know if your issue was unique to your sample, or, perhaps, unique to Craftsman and not Grizzly. You also cannot know the response of Grizzly’s customer service vs. that of Craftsman (did you contact Craftsman?). For the sake of basic fairness, please replace the picture. You are doing Grizzly a disservice for something they have know control over. Pat, I would like to see a pic of your actual sander as I have an old Craftsman 18/36 that I bought for a bargain and it may be my favorite tool! It NEVER trips the reset unless I’m trying to hog off too much materiel in one pass. I have run mine for hours at a time cleaning up old barn lumber. It is a MUCH better tool than my Jet drum sander that I bought new. Patrick did you have it on a dedicated 20amp circuit, or a shared 15amp circuit? Or was it on a long extension cord??? This what you’re looking for? I have no issues with using the Grizzly pic if it is indeed the same tool. I know that Craftsman power tools are just re-branded from another manufacturer so the likelihood that they are identical seems to track true with me. My only question is if it is a new sander why just sell it outright instead of taking it back to wherever you bought it? FWIW, I am in the market for a new (replacement) drum sander and went to the Sears site. The photo of their 18-36 was clearly labeled “Grizzly”. gfadvm, is yours a really old one? I have a fairly new Jet 16-32 and am looking to step up a little. Issues I have with the Jet are changing the sanding belt and setting the tracking on the conveyor belt. Grizzly’s video on changing the sanding belt looks no better that what I have now. Jet recommended that I step up to the PM for about $3K (I think my Jet was around $1K). Does anybody have any comments about the velcro thing? Craftsman hasn’t sold these for a couple of years now. They were imported by a company called Colovos Co. and badged with the CMan name. They were not made by Grizzly. They may have been made in the same factory from the same molds, but they are not the same quality as Grizzly. Sears does sell Grizzly tools online, but not in the stores. 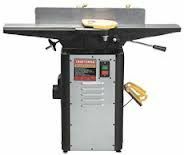 It may or may not be in poor form to add a picture of a competitor when discussing a product but that was the only picture I could find that showed what the drum sander looked like. 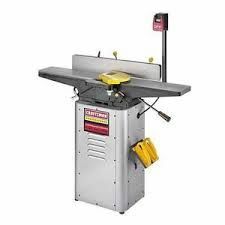 I have looked for pictures of the drum sander but I can’t find any. While you may think it’s unethical for me to show the competition’s drum sander in place of the actual drum sander that was not the intent as was clearly described in my opening statement. I had a 25 amp dedicated circuit breaker just for the drum sander. My next one is going to be a SuperMax. 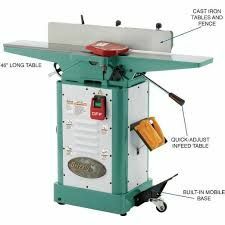 That style of drum sander is basically interchangeable with several drum sander that look exactly alike but carry a different name. Funny thing though, if I would have given the item a glowing report would you have complained that I used a Grizzly picture then? Wow a 25 amp dedicated circuit and it still tripped the breaker? Yep, something’s not right there. Funny thing though, if I would have given the item a glowing report would you have complained that I used a Grizzly picture then? Yes – I would have. You cannot even be sure if the motors between the 2 units are identical – maybe (even, likely), but maybe not. At any rate, thanks for replacing the picture with that of the actual sander in question. It makes for a fair and honest review. Todd – I think he’s refering to tripping the overload on the motor. If that is the case I’d like to know what was done to try to get it resolved. What did customer service do. Why was it not returned. If nothing was done, then that’s the buyers fault. If it kept tripping the breaker, maybe the wiring is insufficinet for the load. It could also be a problem in the motor, which brings us back to, “was anything done to try to get it resolved?”. However none of this is addressed in the review. We don’t even know the model no. so we can avoid that particular sander. 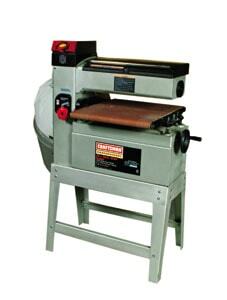 Sears has offered more than one CMan drum sander in it’s recent history. I had the same problem with my performance 16/32. I made a jumper wire and hooked my amprobe on and it was kicking out way under the amp draw it should draw. Now when I use it for any length of time I watch the amprobe and can adjust the sanding speed and pressure. In my not-so-humble opinion, I disagree. This is a review of a tool. A normal user should expect to be able to buy a tool, and when he gets it home and plugs it in the tool works. If nothing was done it’s the buyers fault? That is some warped reasoning there. Put it to the mirror and he could say “It’s a piece of [email protected], kept kicking the breaker, but I turned it back in for a refund so here’s five stars.” My point? A good tool shouldn’t need anything resolved. It shouldn’t need calls to customer service, it shouldn’t require rewiring the shop if the stated amps on the product show the current shop wiring is OK. It should come complete, no need to call for missing parts or rummage through the nuts/bolts bin. It should have clear instructions and a spec sheet. These are things we used to expect when we bought something. Now we’re saying if the buyer doesn’t spend a few hours/days on tune-up or chasing down problems that it’s his fault? I don’t think so. Wow, feel like a punch drunk boxer here LOL. You folks keep a guy on his toes around here. I never really blamed Sears for anything. I bought it from a fellow that buys bulk shipments of items and then sells them from his shop. I live about 85 miles from his shop and had no interest in making a return trip. No, I never tried to contact Sears about the sander. That’s on me and I accept responsibility for that. I also think it should have never left manufacturer. This was not a review about customer service from Sears, it was/is a review about a piece of equipment that had their name on it. I was not impressed with that piece of equipment and stated my opinion of it. The person who purchased the piece of equipment new about it’s short comings and chose to purchase it anyway. Of course the fact that I gave him a very good price made it worth his while. I am not an electrician and I don’t do wiring so yes, it could have been a wiring issue but to the best of my knowledge it was on a single circuit and no extension cord. I have little to no patience with a piece of equipment that does not perform to my expectations. I had talked to other people who had that exact same piece and never had a problem with it. They were truly happy with their purchase. I am not writing about their experience though, I am writing about mine. Every opinion (including mine) needs to be taken with a grain of salt. You may feel free to dislike my opinion or even complain that it isn’t “fair” because I had a representative picture of the equipment instead of the actual piece of equipment up posted. I spent 9 years defending every ones right to their opinion and do not regret one minute of it, well ok, maybe a minute here and there LOL. But the fact remains it’s just my opinion. I will not apologize for it nor will I change to make “someone” happy. I know turn the soap box over to whom ever wishes to use it.